On an all-white set representing an Edwardian nursery, a solitary woman arrives home, picks up a beloved book, and reads aloud, both telling the story and speaking the voices of all the other characters, who are brought to life using bunraku-style puppets and scraps of cloth and paper, in a minimalist dreamscape. True to the haunting qualities of J.M. Barrie’s novel (itself a re-writing of the stage-play), the world of this play is essentially wistful. The action remains in the nursery, and yet it is as much about the loss of childhood as about childhood itself, with a sense of fragility crossed by an almost brutal intensity of feeling. Barrie’s novel is, among other things, a book about the power of books. One aim of this production is to put on stage the slightly disturbing elation of being almost though not wholly, absorbed in reading. 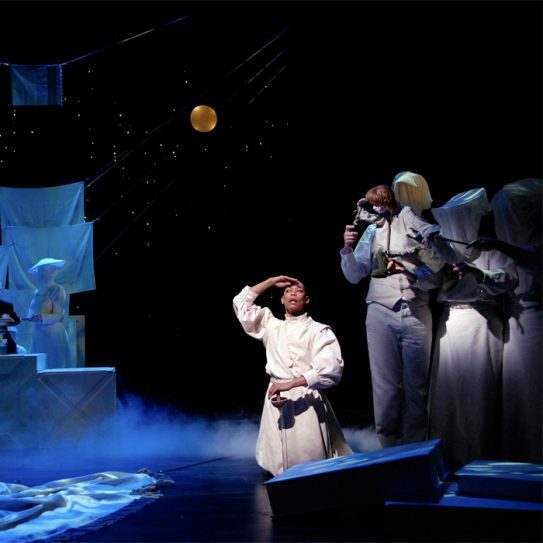 Since its full-length premiere in 1996, commissioned by Spoletto Festival USA, Peter and Wendy has been performed in New York on three engagements, at regional theaters in the U.S., and at the Dublin and Edinburgh International Theater Festivals. It received two OBIE Awards: to the creators for “Best Production” and to Karen Kandel for “Outstanding Performance”.